What is Projectsv13 in SQL Change Automation? I got this question recently from someone that was evaluating the SQL Change Automation client in Visual Studio. After setting up a new PoC (Proof of Concept), they were confused about why there is a new entry in their list of SQL Servers. If you’re wondering, this is what you see in Visual Studio 2017, for the SQL Server Object Explorer. In my case, I’ve actually got a few different instances since I’ve been working with the SQL Change Automation (SCA) for years, across a few versions. As the instance names list, these are LocalDB instances. 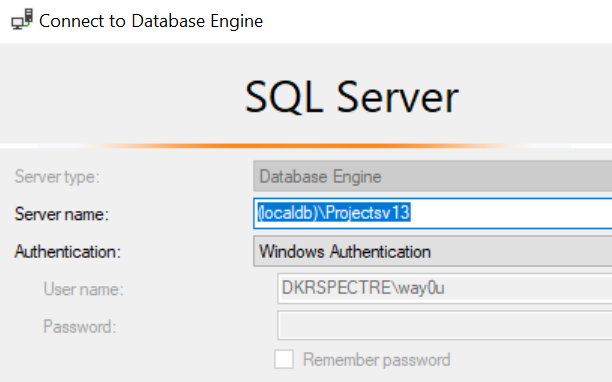 LocalDB is a version of SQL Server that is spun up in process, rather than a service. Other than that, it’s a real SQL Server instance that is running. In fact, if you want, you can connect to this with SSMS. If I connect with those credentials, this will appear in the SSMS Object Explorer as well, the same as any other instance. Why is this in SCA? As an early part of the SCA product, when it was in ReadyRoll, there was a desire to not impose burdens on application developers. If you were working with a project for C# or ASP.NET and wanted to include the database, the idea was to keep things simple. The simple way to get up and running is to use LocalDB, so no install, no worries with Express and a service running, just use LocalDB. This used to be more of a default, but now it’s just one of the options. 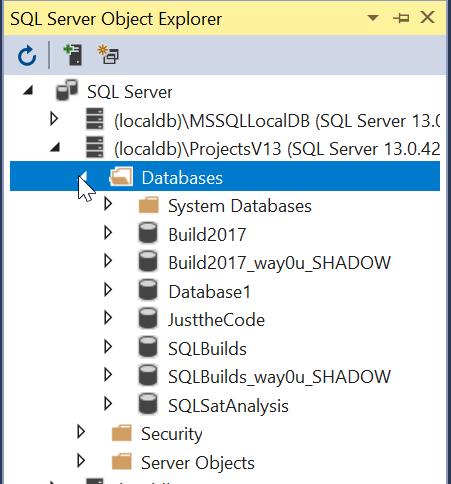 In my case, once I’ve setup my project to connect, the Shadow database, by default, is also right here, and I’ll see both databases under the (localdb)\Projectsv13 instance. All of this is configurable, so you can set things to work in whatever manner works best for you. If you typically have a development instance, either local or remote, you can easily use those instead, and you’ll never need to worry about LocalDB. In fact, if this bothers you, you can disconnect or even delete the instance. 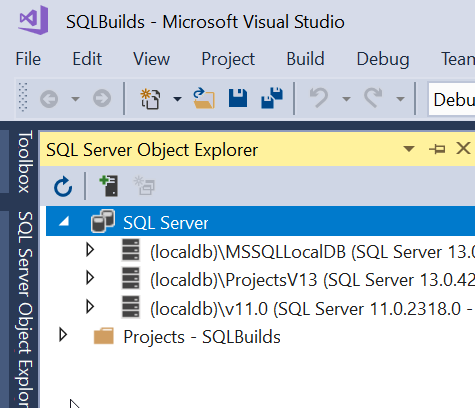 LocalDB is a lightweight way to work with SQL Server, but you don’t need to use it. 3 Responses to What is Projectsv13 in SQL Change Automation? 1. LocalDB is actually a part of Express Edition. 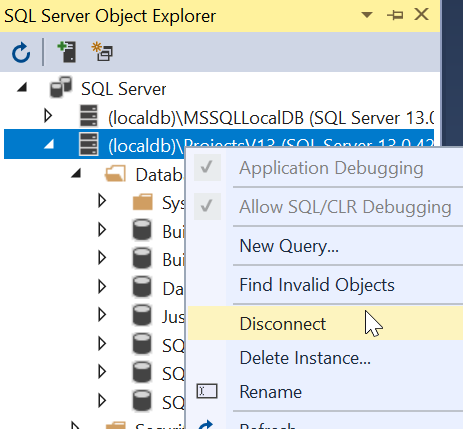 The official name is: SQL Server Express LocalDB. 2. LocalDB was introduced in SQL Server 2012 and is the replacement for User Instances. 3. In SQL Server Express LocalDB 2012, the default instance was “v11.0” (since 11.0 is the actual version number of SQL Server 2012). The naming convention at this time was that the default instance would follow this pattern such that in SQL Server 2014, the default LocalDB instance would be “v12.0”. 4. Starting in SQL Server 2014, the idea of using the SQL Server version number in the default instance name was abandoned, and the new default instance name was “MSSQLLocalDB”. It has remained this way through subsequent releases (i.e. 2016 and 2017). 5. 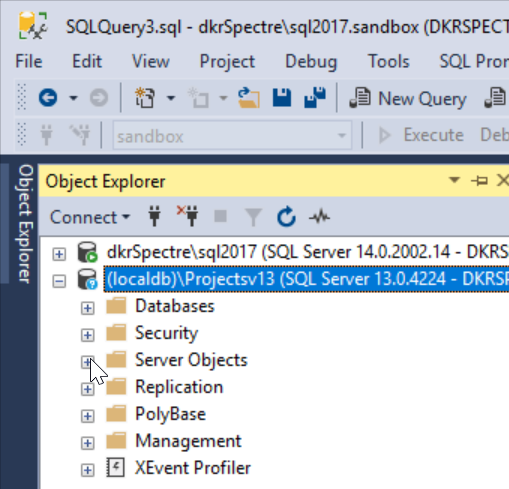 Visual Studio (or possibly more accurately SQL Server Data Tools — SSDT) creates its own LocalDB instances, which is where all new Database Projects go (whether you like it or not). The instance names use the pattern “ProjectsV” + Visual Studio version number. So, Visual Studio (VS) 2012 created ProjectsV11; VS 2013 created ProjectsV12; and VS 2015 created ProjectsV13. I have not yet tried VS 2017, but I suspect it will create ProjectsV14 (of course, if you only have VS 2017 on your system, then maybe it is also using ProjectsV13 for some odd reason?). Thanks, though this wasn’t intended to be a LocalDB tutorial. Just a note on how the SQL Change Automation will surface the LocalDB instance for many people. Understood. I wasn’t trying to shift the focus, just provide additional context since a lot of people are unaware of LocalDB. I figured that for those who don’t know where the ProjectV13 DB came from, they might benefit from knowing how it relates to other LocalDB instances they might be seeing (such as what you are showing). Some folks (like me) might have ProjectsV13 without having SCA, and someday SCA will likely install into ProjectsV14, etc.